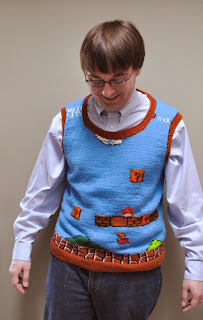 That said, I have to give it up to the woman who made said sweater vest. I mean, the ground tiles, question blocks and even the clouds are pixel perfect! For more information--and more photos--go to happyseamstress.com. Oh, and while you're there, check out the "Baby Link" outfit. Bless harry potter for modeling it.